Struggling Manchester United star Alexis Sanchez is believed to regret his move to Manchester United from Arsenal in January, which saw him turn down the chance to join eventual champions Manchester City, the Mirror reports. The Chilean striker was Pep Guardiola’s main attacking target for two transfer windows before an offer from Manchester United to make him the highest paid player in the Premier League turned his head, leading to him heading to Old Trafford from Arsenal. City refused to shatter their wage structure to sign Sanchez, who is thought to earn £391,000-a-week as a basic wage with a further £75,000 for every first team game he starts, with the Blues refusing to match United’s staggering offer. Sanchez’s City snub led to Guardiola targeting Riyad Mahrez, who he eventually signed in the summer after a failed attempt late in the January transfer window. City instead invested the available funds on defender Aymeric Laporte, who has proven to be a big hit and is starting most games in the City defence now. Alexis, meanwhile, has been a major disappointment at Manchester United, scoring just 3 times in 23 appearances. Mahrez has started slowly at City, with Guardiola’s system known to take time to adapt to, but has recently began to show improved form, finding the net three times in his last three appearances – two of those appearances as a substitute. It will never be known how the former Arsenal star would have fared in the sky blue of Manchester City, but the latest reports indicate he has regrets about choosing Manchester United over Pep Guardiola’s exciting project at the Etihad Stadium. 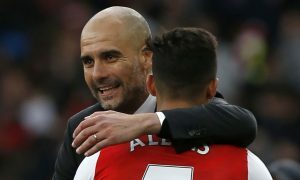 29-year-old Alexis would now be a Premier League champion had he joined City in January, but instead finds himself potentially becoming unwanted in the red half of Manchester if his form doesn’t pick up.